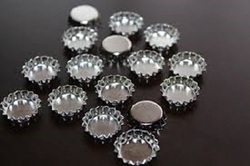 Pioneers in the industry, we offer aluminium small bottle caps from India. With support of our excellent team workers, we have been delivering the best quality range of Small Bottle Caps. Offered bottle cap is precisely manufactured by high grade material and modern techniques. This bottle cap is widely used in liquid containing bottles for preventing these from moisture. The given bottle cap is available in different sizes & customized options according to the customer’s requirements. Looking for Bottle Caps ?